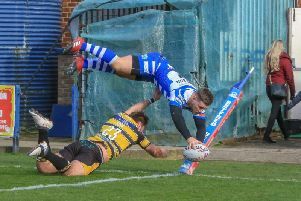 Halifax got a much-needed Championship victory as they cruised home 42-28 against Oldham at Stalybridge. Richard Marshall’s side have been in patchy form so far this season and went into the game on the back of three straight league defeats. But they never looked in danger of that tally becoming four as the piled up a decisive 30-0 interval lead against Scott Naylor’s side, although their failure to really nail down their hosts in the second half highlighted the fact they still have a lot of improving to do.. The visitors made a perfect start when fit-again winger James Saltonstall hared over in the right corner after some sharp play instigated by captain Scott Murrell, half back Gareth Moore adding the conversion. And Halifax doubled their lead on the 10 minute mark, the other winger Jake Eccleston scoring from Moore’s long pass after a break down the other flank from Saltonstall. Moore was on target again and then added a try of his own, dancing through under the posts after slipping through a sliding defensive line. The former Batley player converted that try and then added another four minutes before the break, racing onto Murrell’s slick grubber kick to touchdown and convert. Halifax made it 30-0 at the break almost on the hooter, Murrell chipping the ball delicately over the line and full back Miles Greenwood pouncing to touchdown, Moore converting. Oldham kicked off the second half with a Will Hope try after Halifax failed to complete their first two sets of possession, Steve Roper’s kick cutting the deficit to 30-6. Normal service was resumed when Brandon Moore and Murrell sent Saltonstall in for his second try, Gareth Moore adding his sixth conversion. Hope scored a carbon copy second, Roper again on target as the scoreboard ticked round to 36-12 and then 36-18 after Jamal Chisholm crossed in the corner, Roper again on target. Prop Mitch Cahalane crossed for Connor Robinson to convert to ease any lingering Halifax nerves at 42-18, but Oldham finished well, with Liam Johnson and Adam Clay both scoring, Roper converting one.